This past week was pretty great! While we were contacting a referral for a gentleman named Tom, we ended up teaching him AND his caregiver, a young woman named Jenna. Jenna seemed super interested in what we had to say. At first, she was on her computer, not really listening. But overtime, she started paying more and more attention and asking a lot of really good questions. By the end of our lesson, we left the both of them with their very own copy of the Book of Mormon. It was a super cool experience. We also got our transfer calls in and I will be leaving the Hilltop area here in Richmond. I will be serving in the Danville/Tassajara wards in the San Leandro zone. I have heard a lot of exciting things about this area. 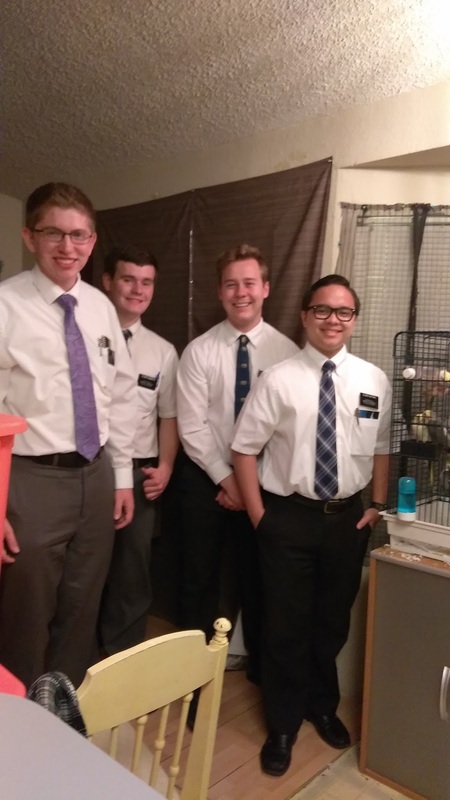 The missionary work seems exciting and the apartment/surrounding area is very safe. That is very good. I got some pictures forwarded to me so this week, you'll be treated to a few pictures! Whooo! I hope you all had a great week and continue to have a great week this week! Love you all! This week, we had temple day which means we get to email today instead of Monday! It has truly been a trying week. Someone broke into our apartment this past week. if you're keeping track, that's 2 car break ins, 1 home break in, 1 curb stomp witness, 3 drug deal witnesses, I've seen a bloodied guy getting checked out by paramedics on the side of the road (there was a shooting on the freeway. apparently some guy's been randomly shooting people on the freeway for years now and still hasn't been apprehended). 4 forest fire witnesses, 1 radiation leak evacuation, and countless accounts of second hand smoke. Not to mention the numberless gunshots each day. Whoo pray for safety for Elder Kaitoku. Other than that, it's been a pretty good week. We were able to go to the temple today and then we had our annual BBQ at the mission home. We got to see people from other zones and hang out and play sports. It was a really great time! I got to see some of my former companions including my trainer, Elder Lui. Anyways I don't have much time! I've gotta go! Until next Monday! This week was super great. Gayle, who I mentioned in previous emails, got baptized in Utah on Saturday! Our members out here are still in contact with her and they let us know first. Elder Roberts and I were super excited to hear that. We had worked with her for a few weeks and had really helped her to overcome a lot. 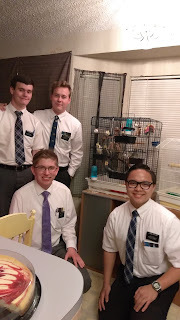 She lived alone and no one celebrated her birthday with her and so we along with Elder Dayton and Elder Tackett went and got her a cheesecake and sang happy birthday. In Utah, after she was baptized, she bore her testimony and shared her story about how the missionaries in California had helped her overcome suicide and depression and come unto Christ. We only found out about all of this because the missionaries called us yesterday and told us. They then thanked us for all that we did to help her. It was a really sweet experience and it was so nice to hear that she had gotten baptized. Additionally, I was able to go on exchanges with the Zone Leaders this week. My new companion for the day, Elder Hermosillo, didn't have a license either so it was back to the #bikelife for a day. It was really nice to get back out there and get some street contacting in. We also found quite a few really solid investigators this week. One of them had met with missionaries and was set to be baptized over a year ago. He was meeting with Elders at first but they both got transferred out and were replaced with sisters. He felt a lot of uneasiness from the sisters. He said they looked scared of him and refused to come in so he stubbornly stopped meeting with them. He was set to be baptized and everything. We politely explained the mission rules regarding teaching someone of the opposite gender (i.e. not being alone with someone of the opposite gender unless a responsible adult of your own gender is also present) and he felt a little sheepish. He is definitely going to be getting baptized soon. PS These pics are pics sent from Gayle to us. Those are her birds! I'm feeling much better this week! Congratulations to all my friends who graduated or are graduating this year. Welcome to the adult world. Hope you're ready for disappointment and taxes. JK go out there and give it your all! Sooooooooooooo. This week was pretty crazy. For the faint of heart (and weak of stomach) this may not be the email for you. Reader discretion is advised. The week started out pretty normally. People being rude, the gospel being true, and the weather being hot and getting hotter. We had the opportunity to go on exchanges with the other members in our district on Thursday and then the Zone Leaders on Saturday. I had the opportunity to go with one of my zone leaders to the Oakland Temple's Visitor's Center. It's a little drive out of the way. We were able to meet with a less active woman who had been inactive for a while and so she didn't know much about the temple. We were able to show her a lot of the videos and resources about the temple. It was really cool. The V.C. is a great tool and place to feel the spirit. 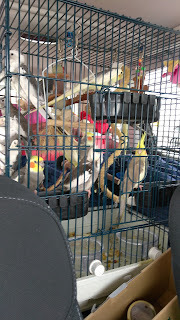 On the way home, we were caught in quite a bit of traffic. It was stop and go for a while. We noticed that the license plate of the car in front of us had a "BYU COUGARS" decoration on it. We thought to ourselves, "Wow look! Members!" 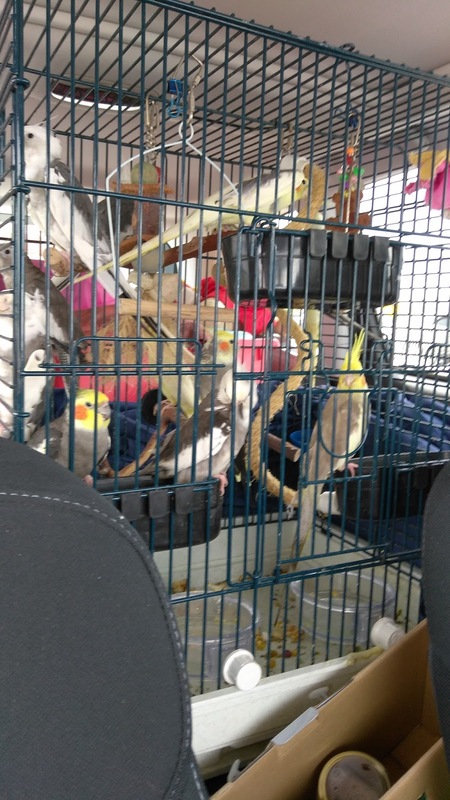 I turned to my companion and said, "It'd be really awkward if we rear ended them." . Not 30 seconds had passed before he looked out the side window and didn't realize that traffic had stopped. I swear I spoke in tongues in that moment. I saw the back of the car in front of us getting closer and closer really fast. I said something really brave and calm like, "ALKFJOEIHFKLESJFIOESLSKEJFSKFJELSJFOIESJKSEF" and suddenly we found ourselves on the side of the road exchanging insurance info. For my first car crash ever, it was pretty.....underwhelming. I'm thankful that no one was seriously injured. Good times. Other than that, it was a pretty normal week. You can bet, I will be roasting my zone leader until the end of time for this. Also, I've been kinda sick. I've thrown up nearly every night the past few days. Pray for Elder Kaitoku. This past week was really good. We've recently had to drop quite a few investigators the past few weeks but this week, we were able to find a lot of people. One of those investigators is named Bill. We were contacting a referral and he was sitting outside across the street. We started a conversation and he suddenly said, "Yeah I'd love to talk. You guys like Burger King?" He took us out to lunch and we had a good long talk about a lot of things. We invited him to read the Book of Mormon. He kept commenting on how much he respected us. He said we had a really great spirit about us and felt we were good, honest men. Sorry again for not emailing the past few weeks. I appreciate your love and support and prayers. All is well, all is well. In conclusion, I got to make really good use of my doggie treats again this week. There was a really big German shepard and a lil dog that were behind a fence. We calmed him down with a few treats and slowly opened the gate to knock the door. My companion went for the door while I held off the dog. The dog would get on edge and then I'd give it another treat. One of our investigators named Gayle has finally found a place (we think). When we met her, she was super accepting of the gospel. She was getting evicted and wanted to move to Utah. Our amazing member drove her all the way to Utah to help her as well as paid for a week of Motel lodging. He is truly amazing. It was a struggle to get in contact with the ward in Utah to help her but the Relief Society President was able to offer her lodging at a vacant apartment that she rents out. Everything has finally worked out. All is well. On our way out, the dog started to get a little more and more confident and aggressive. I tossed one final treat down the driveway and then we made for the gate. It had scarcely closed behind us when the dog came growling and barking at the gate again. So sorry about not emailing last week (I know how much you all look forward to reading my emails each and every week) This past week has been pretty hectic. We did a LOT of service these past two weeks. We've helped a member do her ceiling. We applied mud and sanded the ceiling while the high priests did the heavy machinery work. We also helped with the "Feeding Children Everywhere" project in which we were able to work towards feeding 300,000 hungry children in the area. We also got to meet a really sweet lady named Gayle. She has been looking to move and she's been praying about where. Suddenly, the thought of "Utah" came to mind. She grew up in Idaho and figured Utah was pretty similar and decided to move there. Then she thought to herself, "Utah = Mormon" So she decided to tell Siri, "Siri, call the Mormon Church". Siri dialed the Catholic church and so she tried again. The second time, it connected her with a missionary in Missouri who referred her to us. She has such a strong testimony already and actually testified of the truth of it to an atheist employee at a Motel 6. It was incredible to watch. She lives alone and didn't have anyone to celebrate her birthday with so we brought over a strawberry cheesecake with some other Elders. It was a really sweet time. Transfer calls came and went. Elder Roberts and I are staying for another 6 weeks. I have really come to love and trust the ward members and come to love the people here. Each day, I learn something new and can feel myself changing and becoming more and more like the person that Heavenly Father wants me to be. I love this work and I love you all! Hopefully I'll get a camera soon so I can send some pictures.